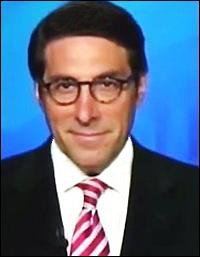 A lawyer who is part of President Donald Trump’s legal defense team, Jay Sekulow, has denied the news reports that Deutsche Bank has received a subpoena from Special Counsel Robert Mueller’s office for banking records related to Trump and his family members. “The 2011 tax return for CASE, publicly available at GuideStar.org, shows that in just the two-year period of 2010 and 2011, the nonprofit took in over $81 million. The charity is structured as a 501(c)(3), meaning that both its income is tax exempt and donations made to it are tax deductible – a big tax subsidy from the U.S. taxpayer. “Jay Sekulow is the President of CASE and his family fills four of the five slots on the Board of Directors. His wife, Pam, is the Secretary; his two sons, Jordan and Logan, are Directors; his brother, Gary, is the Chief Financial Officer and Chief Operating Officer. “Gary Sekulow is both the CFO of CASE as well as Vice President of Finance at ACLJ. In 2011, Gary Sekulow’s compensation from the two totaled $557,787. The 2011 tax return for the ACLJ shows Jay Sekulow receiving zero in ‘reportable compensation’ and zero in ‘reportable compensation from related organizations.’ That seems highly debatable. “The 2010 and 2011 990 tax filings with the IRS show that ACLJ paid a business called the Constitutional Litigation and Advocacy Group a total of $5.6 million in just that two year period. The tax return notes that Jay Sekulow owns 50 percent of this business. “The 2011 tax filing with the IRS by CASE shows Jay Sekulow receiving $97,848 in ‘reportable compensation’ with zero ‘compensation from related organizations.’ Under ‘independent’ contractors, CASE lists Regency Productions with a payment of $740,365. Part IV of the tax return notes that Jay Sekulow owns Regency. It also lists his sister-in-law, Kim Sekulow, as owner of a company called PFMS which received $528,705 for radio and TV agency work. $15.4 million to the Constitutional Litigation and Advocacy Group, a law firm co-owned by Jay Sekulow. $5.7 million to Gary Sekulow, Jay Sekulow’s brother. $1.6 million to Pam Sekulow, Jay Sekulow’s wife. “One month after stepping down as U.S. Attorney General in 2005, John Ashcroft accepted a part-time teaching position at Regent University, a Christian institution founded by [Pat] Robertson, who is currently Chancellor and Executive Chairman at the University. Ashcroft has remained at Regent University, currently serving as Distinguished Professor of Law and Government. Sekulow is on the Board of Regent as well as a member of the Regent Law faculty. “In 2005, the same year that Ashcroft stepped down from the Department of Justice and accepted a faculty position at Regent, a nonprofit was formed by Sekulow called the Law and Justice Institute. Under its program description the following year, it stated: “Contract to provide the services of distinguished individuals to participate in educational activities related to the organizations exempt purposes: Regent University School of Law – Distinguished Professor of Law and Government.” That title is the one carried by John Ashcroft. Despite the propaganda that right-wingers believe in freedom and liberty, Sekulow has indicated that he was involved in helping John Ashcroft write the anti-freedom legislation known as the USA Patriot Act. “We supported the Patriot Act…we helped write the Patriot Act…we were working with Attorney General Ashcroft when we wrote it,” Jordan Sekulow said.